You may be wondering where to begin clearing gluten out of the pantry. 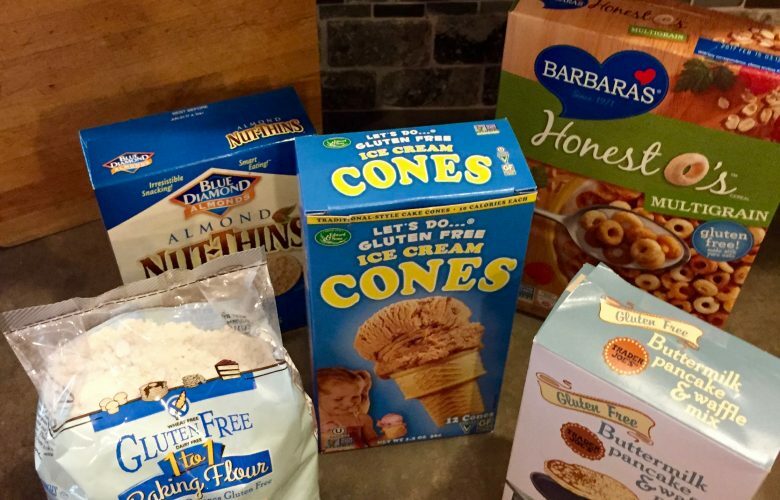 A gluten free pantry doesn’t have to be as scary or painful as you think. If you are considering going gluten-free for yourself or your family just start planning now. Give yourself a few months. (Unless you discover a celiac disease and then it needs to be immediate.) If you don’t want to throw food in the trash, go ahead and use it up (or give it to a local charity), but don’t add anything new to your grocery shopping list that contains gluten. A good starting place is to separate your gluten products in the pantry. Actually move them to their own shelf. Then you can actually see what you’re dealing with. I have learned to read labels on everything. Sauces, cereals, soups, chips, EVERYTHING. You will be surprised by what products contain gluten. Soy Sauce, ceral, canned soups, corn tortillas (with wheat), and most prepared foods. Once you identify the foods you buy consistently that contain gluten, you will know not only what you need to cut out, but what you need to find a replacement for. We love waffles on Saturday mornings, so that was one of my first replacements. I tried out lots of recipes and wheat flour substitutes. Most were decent, many I will share. 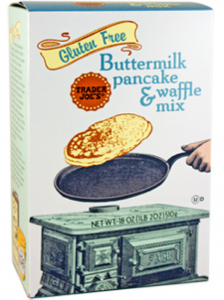 But for a go-to waffle substitute our favorite is Trader Joe’s gluten free pancake mix. I doctor up the recipe like crazy for my own waffles, but it’s a great base to start from. Ice Cream cones were another immediate switch I made. The first few times we tried gluten-free cones we were not in love. 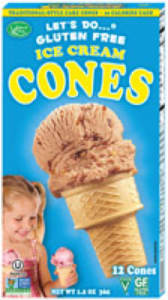 But We found “Let’s Do Gluten-Free Ice Cream Cones” were pretty good and made the switch. Pasta is another pantry staple that has to be addressed. Start working with gluten free brown rice pasta, quinoa pasta, or grain blend pastas right away. Some you will like more than others, but don’t give up. After you try a few different kinds you will find one everyone in your family prefers. I keep brown rice pasta on hand all the time for buttery, parmesan pasta (instead of mac and cheese). I also always leave a little pasta water in the pot to keep the gluten free brown rice pasta from hardening up. While we’re on the subject of pasta let’s talk about meatballs. (Even though hopefully they won’t be in your pantry.) Most premade meatballs include breadcrumbs. You’ll have to make your own, but no fear, I have an amazing recipe for you. What about gluten free flour? I no longer keep any wheat flour in my pantry. My “go-to” flour now is oat flour. I always have a big bin of gluten-free oats (which really means the naturally gluten-free oats don’t touch any wheat in the factory). A spare coffee grinder comes in handy for grinding oat flour whenever I need it. I don’t grind ahead of time because I like the oat flour to be fresh. Coconut flour, tapioca flour, and almond flour all get stored in the freezer, also for freshness. There are several good premixed gluten free flours on the market such as Bob’s Red Mill All Purpose Baking Flour. Rice crispy cereal (not Kellogg’s) or granola (sometimes homemade) are great subs for all other cereals. Dont’t forget to read every cereal label as most contain some sort of wheat. I have to mention that high fructose corn syrup or food coloring are also yucky and should be avoided. Just don’t buy it! My son was especially worried about bread. There are so many recipes to try and many we liked. Making your own bread can be a little time consuming, but who doesn’t love freshly baked bread? Also, a bread maker helps make the process doable for a busy family. 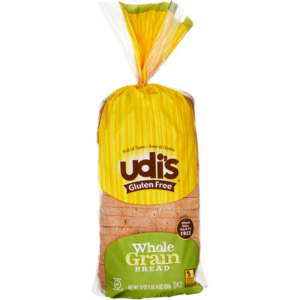 My go-to back up bread source when I don’t have time to bake has become Udi’s 30 oz. Gluten Free Whole Grain Bread from Costco. 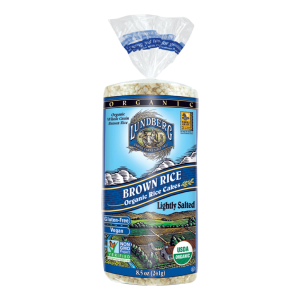 This I keep this in my freezer for sandwiches. I pull out a few slices when needed and let them sit on the cutting board until they are defrosted. Helpful Tip: Most gluten free breads must be stored in the freezer or used within a day, otherwise they become stale. Rice cakes have also replaced bread for us. We eat them for breakfast with homemade nut butter or for dinner as little pizzas with sauce and cheese. The last step in clearing gluten out of the pantry is the candy jar. Sadly, the candy jar has to be purged. My kids keep a stash of left-over Halloween or Parade candy for movie nights. Candy is definitely a once in a while treat in my house because of the corn syrup, food coloring, and who knows what else. But when I started going through their stash I was surprised to find many candies contain gluten. Twix, Kit-Kat, Whoppers, Twizzlers, and more. I learned again, you have to read every single label. By the way, I recommend purging the candy jar after your kids are in bed. Saying goodbye to Twizzlers can be painful. Ready for the good news? Clearing gluten from the refrigerator tends to be much easier then the pantry! Mostly it holds naturally gluten free food. Fruits, vegetables, nuts, and other proteins are naturally gluten free. Yay! Clearing gluten out of the pantry might feel overwhelming at first. Give yourself time and be gentle with yourself and your family. Taste buds will have to change a little, but they will. For almost every favorite gluten filled food you love, there is a tasty alternative waiting to be discovered. Homemade goodies are almost always better then pre-made. But for busy people little short cuts sometimes save the day. So these are my tips to get you started clearing gluten out of your pantry. Go ahead, tell gluten to Get Lost!